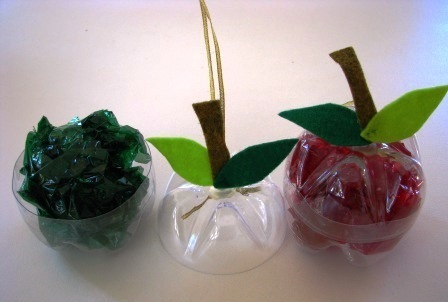 Last year I saw this fabulous idea at Creative Jewish Mom: she had made apple-shaped gift boxes from the ends of plastic bottles. For better or worse we don’t buy much in the way of soft drinks, so it was quite some time before I finished two bottles of tonic water and was able to make my own version of this great idea: a hanging decoration which we can use both for Rosh Hashanah and for our sukkah. – red or green cellophane (or tissue paper, or fabric.) The beauty of cellophane is that the light shines through it. 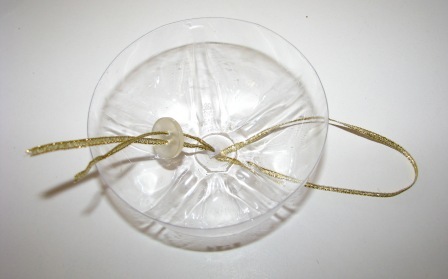 – thin ribbon or similar to hang the apple up, and a button to hold this in place. 1. Carefully cut off the ends of two plastic bottles. I found cutting one a centimetre or so taller than the other meant I could overlap them and they stick together even without glue. 3. 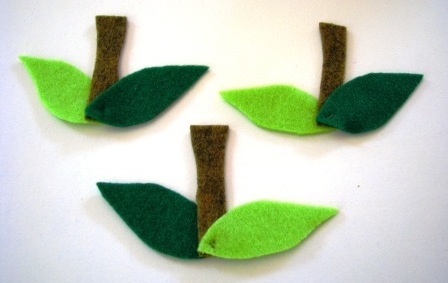 Cut leaves and a stem from felt and stitch them together (glue might also work but thread seemed more secure to me.) Stitch the leaves and stem to the ribbon. If you’re more organised than me, you might even be able to do this in one step rather than in two. 4. 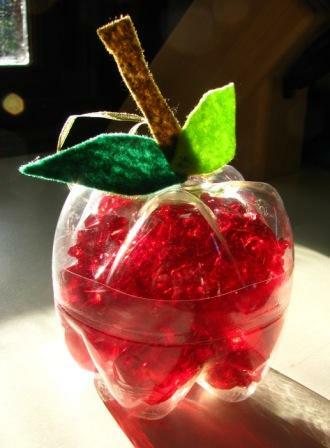 Scrunch up some cellophane or other paper/fabric to provide the colour of the apple and put this inside. 5. 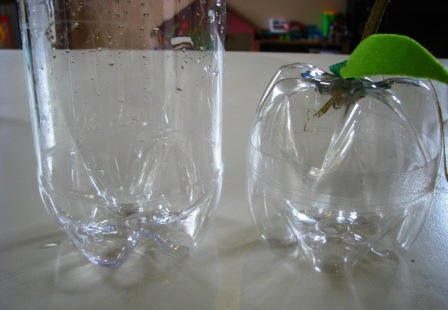 Slot the plastic bottle ends together. Glue or tape them if necessary. 21 Responses to "Apple decorations from recycled plastic bottles"
Now I am going to have to collect other people’s soda bottles all year long, just so I can program this for a workshop. Love it! The felt and the cellophane really make this idea extra-super-cute. 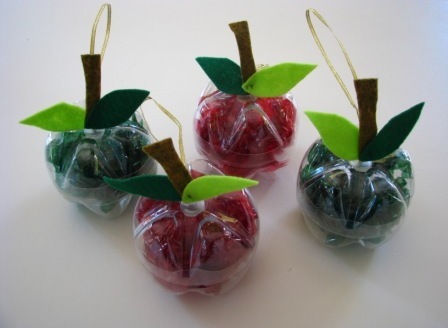 This is a really cute idea for teachers to use for Johnny Appleseed day if you need a craft. It is lightweight enough that they can be hung at the windows of the classroom and they will brighten up the dullest room while reminding the kids about the story. They can then be saved and used as an ornament on your Christmas tree. for more ideas, check out americanjewishhome.blogspot.com. That is a great idea – thank you for the suggestion! You can also paint the bottle ends with red semi-glass Krylon spray paint and put candy of snacks inside.